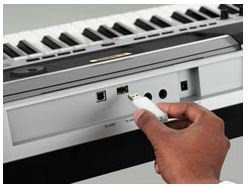 Click the button below to add the YAMAHA Keyboard PSR i455 - EBF to your wish list. PSR-I455 has 753 voices and 206 styles built-in, 19 voices feature Indian instruments and 26 styles provide automatic accompaniment ideal for Indian music. Naturally, the electronic Tabla and Tanpura-which are indispensable to this type of music-can also be found here. In fact, this keyboard's Tabla and Tanpura can be set and played in exactly the same way as stand-alone instruments. What's more, the PSR-I455 also comes with raga-mode practice songs that can be conveniently used for instrument and voice training. The PSR-I455 also features a number of enhancements to core functions. 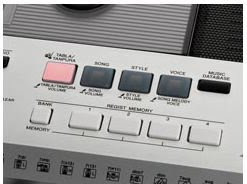 It has its own 10- song, 6-track sequencer, as well as a USB TO DEVICE terminal for rapid, convenient storage of songs, styles, and Registration Memory data. Meanwhile, a pair of knob-type controllers provides for more-expressive live performances-for example, they can be used for real-time control of assigned effects such as filters or to modify Arpeggio function patterns, of which 162 different types are included.Not only keyboard playing, but also DJ performances can be made much more dynamic and exciting using these controllers.